Heal your ankle sprain and get back in the game FAST with our ARP Wave Nerurotherapy treatments. 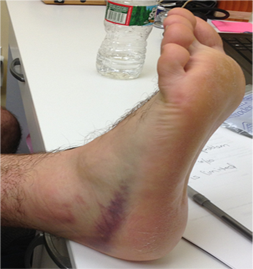 Swelling in and around the ankle sprain is the first thing that must be addressed. If you choose, standard treatments – ice and anti-inflammatories, you reduce blood flow and slow healing. Our swelling protocols increase blood flow and can show measurable changes in the swelling within 5 minutes! Once the ankle swelling is under control – we can begin making changes that you will be amazed by! If you have a truly severe ankle sprain Grade 3 or severe syndesmotic (high) ankle sprain – we may have to modify your protocols to have you sleeping with the ARP technology for an even more rapid healing response. On a Grade 1 or 2 ankle sprain – Using the ARP Wave Technology and protocols, we can have you back in the game in as little as 10 days or less. The ARP Wave technology works on the theory that injuries occur when our body is not able to absorb force correctly. If the muscles are working correctly they act as “shock absorbers” by creating an eccentric contraction (controlled lengthening) of the muscles. When you don’t absorb force correctly the force is placed on the joints or tendons that are made to guide the motion – not absorb the force. Then injury occurs!! In traditional medicine, injury care is directed at the area of the injury which is where the pain ended up. ARP Wave protocols search for the neurologic origin of the problem. Treatments work to provide a Neuro-therapy and re-establish proper communication within the muscles and nerves. When the muscles are able to absorb force correctly – your pain goes away, your injury heals, and you are stronger, more balanced and able to get back to your sport. In the VERY FIRST SESSION, with the ARP Wave device and proprietary protocols, you will see an immediate reduction in pain in the sprained ankle area and an immediate increase in your range of motion and flexibility. Why? Because after locating the origin of your injury in this first session, we are able to put the muscle into ECCENTRIC CONTRACTION (lengthened) and take you through the movement that hurts the most. The improvement in this very first session will be astonishing. We will have turned on the appropriate muscles and transferred the force AWAY FROM THE INJURED ANKLE and into the correct muscles (shock absorbers). With the muscles in eccentric contraction, they are now firing properly and absorbing force. At the end of this FIRST SESSION you will see a 25% reduction in pain and a vast INCREASE in range of motion. In the second session another 25% reduction in pain and so on until session 4 where typically you’ll be PAIN FREE! How is that possible? We will have broken down the scar tissue and reduced the inflammation in the muscle that was not absorbing force and, more importantly, transferred the force AWAY from the injury and into the muscles; eliminating pain all together and allowing for active movement. Traditional therapy of rest, ice, compression, elevation and stim would have continued to focus on where it ended up and the healing process would STILL be in its infancy. Ever wonder why players are lost for long durations of time and even for seasons? Because traditional therapy does NOT work. Under the best circumstances therapy will speed the process up slightly and RARELY will correct the faulty movement that caused the injury. Fixing Movement is tricky work – it is estimated that a neurologic pathway must fire in correct movement at least 4000 – 6000 times in order to improve communication between the brain and muscles. That is a lot of exercises on an injury with traditional therapy. On the ARP Wave System, however, we are contracting the muscles at 500 times per second. That is like doing 40,000 repetitions of exercise in a single session – all in perfect form for true changes in your movement patterns. The ARP Wave current also causes substantial increase in blood flow to the injured area while treating the injury with ACTIVE movement. Something no other therapy can replicate. This allows us to take an 8 week recovery time frame, for example, down to 8 days or less with BETTER RESULTS and a stronger player. Treat the ORIGIN neurologically, you ELIMINATE the injury physiologically at an accelerated pace. SESSIONS 5-10: PAIN FREE, ACTIVE MOVEMENT… AND BACK ON THE FIELD! In sessions 5-10 we will now take you through proprietary protocols to break the neurological pattern that caused this injury in the first place. In essence, teach the muscles to respond in the correct way and move properly neurologically. Once this is accomplished, you are PAIN FREE, INJURY FREE. Each of these sessions is followed by individualized force absorption tests to ensure you are continuing to get stronger, more stable and able to absorb force correctly. After your 10th session, you should be back to the activity that was causing your pain, whether it be running, jumping, lifting weights or whatever activity was painful before you came to see us. After the 10th session, you’re back on the field! SESSIONS 10-20: STRENGTHENING AND LONG TERM STABILITY! In sessions 10-20 we have proprietary protocols to strengthen the muscles and avoid future injury. This is again – not your usual rehab – The ARP Wave will help you become stronger, faster, and more stable. Sessions last about 30 minutes and you will work harder than you ever thought possible without weights. There is a reason more than 650 NFL Players trust us to get them back fast. Because it works… and it works FAST. The ARP Wave System can get players back from injury 60-70% FASTER than traditional therapy. When a player comes to us after being told they will be out 6-8 weeks or more, they know that we will get them back in a fraction of that time frame. They KNOW this because we will find the ORIGIN, treat it, eliminate the physiological symptom and in the process make them stronger and FASTER than they were prior to the injury! No one can do what we can do when it comes to accelerating the healing process. NO ONE. And for those athletes that make their living with their body, its results… FAST RESULTS, that matters most. YOU WILL FEEL BETTER YOUR VERY FIRST SESSION… GUARANTEED. OR YOU PAY NOTHING! In your very first visit with us we will locate the origin of your symptom, take you through a treatment, and at the end of this session, you will have increased your range of motion by 25% and seen a similar reduction in pain- GUARANTEED. If you don’t think that we can HELP YOU to eliminate your ankle pain, you pay NOTHING.